New Xtra Detergent Coupon Means As Low As $.94 Per Bottle At CVS, Rite Aid And Walgreens! There is a great new $1/2 Xtra Detergent coupon available today! CVS, Rite Aid and Walgreens all have Xtra on sale this week, so here are three ideas for you:Walgreens Buy 2 Xtra Liquid Laundry Detergent 30 or 34 loads 2/$3 Use $1/2 Xtra Detergent coupon Final Price: 2/$2 ($1 … [Read more...] about New Xtra Detergent Coupon Means As Low As $.94 Per Bottle At CVS, Rite Aid And Walgreens! Arm & Hammer Detergent Coupon (Back!) Means $.99 Detergent At CVS, Walgreens Or Rite Aid! Both the $1 Arm & Hammer Power Paks coupon and $1 Arm & Hammer Liquid Detergent coupon are back, so be sure to grab yours if you haven't already! Both Rite Aid and CVS have Arm & Hammer Power Paks 21 ct on sale for $1.99 through 2/13, so here's what you can do:Arm & Hammer Power … [Read more...] about Arm & Hammer Detergent Coupon (Back!) Means $.99 Detergent At CVS, Walgreens Or Rite Aid! 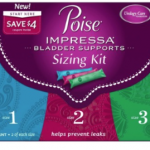 Poise Impressa Bladder Supports As Low As $.99 At Walgreens, Rite Aid, CVS And Target With New Coupon! Grab this new $2 Poise Impressa Bladder Supports coupon and take it with you to score a great deal at Walgreens, Rite Aid, CVS or Target! Here's how:At Walgreens:Poise Impressa Sizing Kit 6 pk $4.99 Use $2 Poise Impressa Bladder Supports coupon Pay $2.99, Get $2 RR Final Price: $.99At … [Read more...] about Poise Impressa Bladder Supports As Low As $.99 At Walgreens, Rite Aid, CVS And Target With New Coupon! 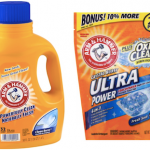 New Arm & Hammer Power Paks Coupon Means $.99 Detergent At CVS, Walgreens Or Rite Aid! There is a great new $1 Arm & Hammer Power Paks coupon available today! Both Rite Aid and CVS will have Arm & Hammer Power Paks 21 ct on sale for $1.99 starting the week of 2/7, so here's what you can do:Arm & Hammer Power Paks 21 ct $1.99 Use $1 Arm & Hammer Power Paks … [Read more...] about New Arm & Hammer Power Paks Coupon Means $.99 Detergent At CVS, Walgreens Or Rite Aid! New Arm & Hammer Coupons Means Laundry Detergent Only $.99 At CVS And Rite Aid! Print the new $1 Arm & Hammer Liquid Laundry Detergent and $1 Arm & Hammer Power Paks Laundry Detergent coupons now and hold onto them until 2/7 to score Arm & Hammer Liquid Laundry Detergent or Power Paks for $.99 at CVS or Rite Aid! (You'll only be able to print each coupon once). Here … [Read more...] about New Arm & Hammer Coupons Means Laundry Detergent Only $.99 At CVS And Rite Aid! High-Value Kleenex, Cottonelle, Scott, Viva & More Coupons Mean Free Tissue Boxes & More! There are a bunch of awesome new Kimberly Clark product coupons available under zip 77477! (Change your zip and refresh the page to find your coupons right away! )$1 Scott Bathroom Tissue coupon $1 Viva Paper Towels coupon $1 Kleenex Facial Tissue coupon $1 Cottonelle Toilet Tissue … [Read more...] about High-Value Kleenex, Cottonelle, Scott, Viva & More Coupons Mean Free Tissue Boxes & More!